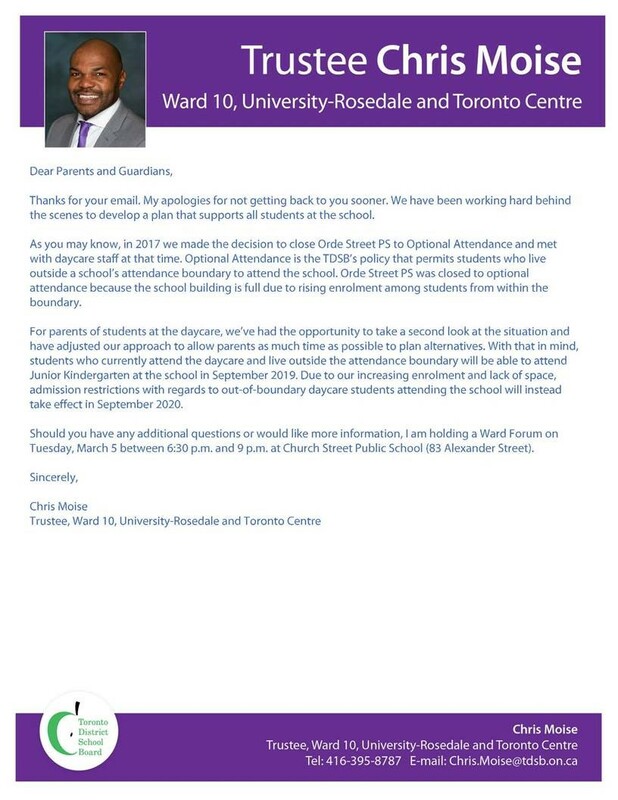 Out of District families planning on attending Orde Street Public School. On February 15, 2019 Orde Day Care was informed by Orde Street Public School that children currently enrolled in the preschool daycare who live outside of the residential boundaries of Orde Street Public School will not be admitted into the school for kindergarten starting September 2019. These families are being asked to return to their home school for kindergarten and access the licensed child care center affiliated with their school. Only parents who have no access to child care at their home school may be considered for enrollment in the kindergarten program at Orde Street Public School. A town hall meeting will be held next week, time and date yet to be determined. We are asking all parents who will be affected by this new requirement, and those parents who have younger children to attend. We are also asking our in district families in our preschool program to attend this meeting to show your support for our out of district preschool children and families. Please contact Anna Gionet or the Orde Day Care Board of Directors if you have any questions or concerns.